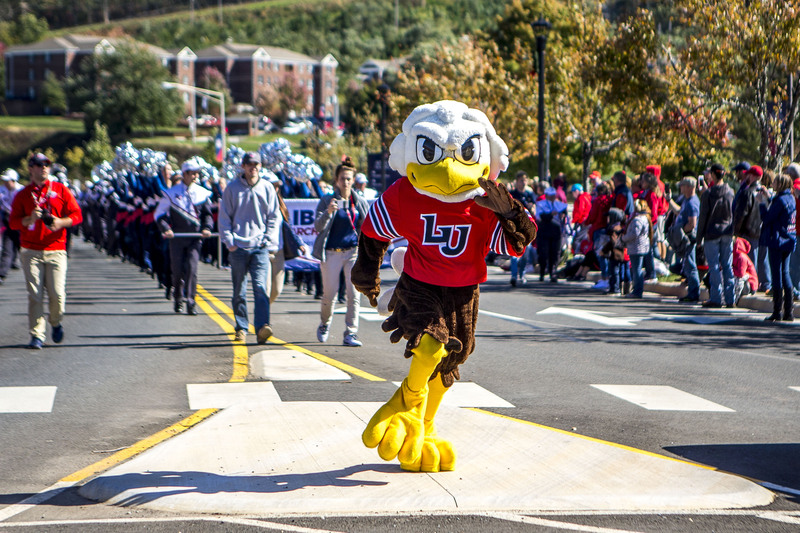 The goal of any successful mascot is to delight people of all ages, and Liberty University’s “Sparky” has enthusiastically been doing his job by entertaining Flames fans since 1977. Sparky is tasked with pumping up those in the stands at Liberty’s many athletic competitions, representing the school in various community events, and competing in the UCA College National Mascot Championship. The five performers who don the suit — as well as the rest of the mascot team — consistently strive to be a worthy symbol for the university. Jordan Ballard, head coach of the cheerleading team, noted that the objective at the end of the day is to make everyone enjoy themselves and have fun with Sparky. “Sparky’s ultimate goal is to make every person in attendance feel like his best friend,” Ballard said. For almost 40 years, Sparky has been a figure on Liberty’s campus. His likeness has evolved over the years just as much as the campus itself. According to Ballard, Sparky began with a thinner, chicken-legged figure, but became more rounded and kid-friendly in the early 2000’s before finally settling into his current look, which is more of a “fighting Sparky” image. While fans and admirers only see the outward presence of the mascot, the five performers who take turns in the costume have a unique perspective of what it is to be the embodiment of school spirit. John Smith, the head mascot, has spent three years behind the mask. He does not struggle to find a good reason for the time he puts in. “The answer is pretty simple: either you’ve made a kid’s whole week better, which happens all the time, or … you had the opportunity to lead … the team out of the tunnel in front of thousands of fans,” Smith said. Smith said he loves the anonymity and secret celebrity status of the experience as he sees the same people in the halls who were shouting “his” name the day before when he was in the costume. While he cannot tell any of his friends about his work as Sparky, Smith said he loves the many unique chances afforded to him by being Sparky that he otherwise could never do. As only a select few are able to wear the suit, an exclusive mascot club — or “furternity” — has developed between all of the past and present Sparky performers. Smith said he made a secret Facebook page for the members to stay up to date with the team and connect with others who have to keep the same secret. “We love to keep the secret alive as we share it with each other and pass on the torch from one person to the next,” Smith said. As the symbol for Liberty’s athletic program for close to 40 years, Sparky continues to energize and entertain people of all ages with his antics. Tryouts for new performers will be held in the spring, and Smith encouraged anyone with hopes of entertaining thousands of fans to try joining the team. Editor’s note: John Smith is not the true name of the current mascot. While the quotes are real, the identity of the bird needed to be protected. Klinker is a feature reporter.